Jesus vs Dawkins - who is best at Christmas? Christmas is with us again and with it gifts are being given – and if you are particularly lucky you got the God Delusion by the supreme pontiff of atheism, Richard Dawkins. On the other hand, you may be sitting around the table quoting your favourite Bible versus at each other and regaling each other with the life of Jesus. But which is the most joyous text to read at Christmas? By the way, this post was meant to go up on Christmas day but server problems are a thing apparently. Before we run things through the sentiment analysis of LIWC, let’s only look at the actual sayings of Jesus, for while the New Testament is largely about the fellow, it contains things such as the letters from St Paul that are of a strong opinion compared with other bits. Luckily JB Philips has highlighted all the sayings of Jesus at his page so we can take those and then run them through the sentiment and word analysis tool I use, then we can split it out by Gospel/Acts and Revelations, and then run it past Dawkins’ God Delusion (minus the end notes, chapter listing and all that). What do we find? First of all, it’s that Jesus is a sensual person, ahem. Unlike the biologist, who presumably deals with all things bright and beautiful all day long, the Son of Man appeals to the physical, to touch, sight, sound at around twice the rate of Dawkins, at 0.96% of content relating to the body in Jesus’ sayings and only 0.48% in Dawkins’ words; perceptually it’s 2.43% for the Nazarene and 1.5% for the Oxonian. What about for happy messages, for surely Christmas is a time of joy? 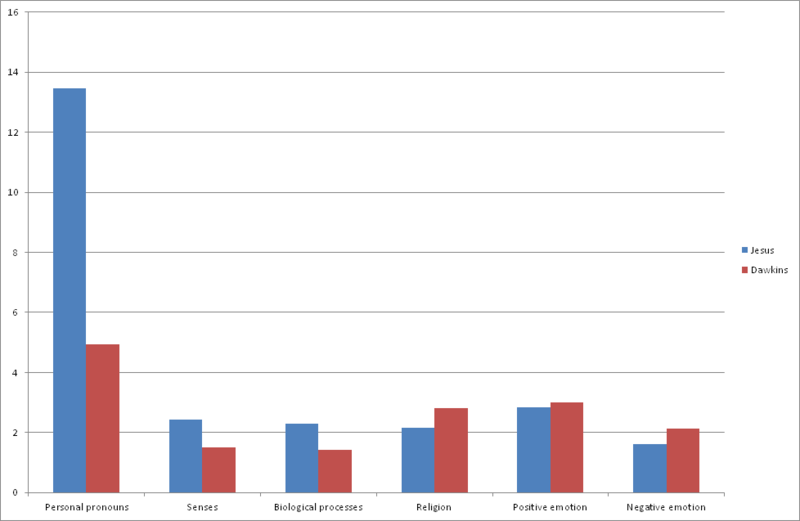 Actually Dawkins is slightly more joyous, with 3.01% of his words classed as such, while Jesus chalks up 2.85%. However, when it comes to negativity, keep away from the scholar – 2.1% of his words are rather down heartening rather than 1.6% of Jesus. Of course, if it is pure uplifting words you want, the Gospel of Matthew is the most positive at 3.1%. Of the content, Jesus may keep you a bit more merry and thinking of those around you – a whopping 17% of his words are to do with social processes, such as family, at 1.2% while Dawkins can only muster 7.9% and talks of family only 0.25% of the time. Dawkins is also twice as angry as Jesus – not bad when we consider that Dawkins is going up against a man who has a tendency to flip over tables of money changers and will come again to judge us all and cast down the wicked. When it comes to talking about people, Jesus is all for talking about us. Around 13% of his words are pronouns, meaning he is talking about himself, other people, us and the like, while Dawkins keeps his distance at just 5% of content. Finally, what of religion? Well if you want to avoid talking about religion, listen to Jesus – Dawkins’ book, funnily enough for the God Delusion, talks of religion more than Jesus does at 2.8% rather than the Messiah’s 2.15% (perhaps justifying those who say Christ spoke more of living a good life than building the process of a church). So why is Jesus a bit less preachy than Dawkins, despite expectations? Perhaps because His sayings are tangible – sayings such as “You have heard that it used to be said, ‘You shall love your neighbour’, and ‘hate your enemy’, but I tell you, Love your enemies, and pray for those who persecute you, so that you may be sons of your Heavenly Father.” Solid actions (if you count prayer as such), simple emotive words of love and hate, easy to grasp social-related words such as enemy, friend, neighbour, son and father. I’m picking at random, but compare this with Dawkins’ “The ontological argument, like all a priori arguments for the existence of God, reminds me of the old man in Aldous Huxley’s Point Counter Point who discovered a mathematical proof of the existence of God.” A lot of Latin (more so than the Bible), a lot of long words – is an ‘ontological argument’ something easy to pick up? It reminds me of Orwell’s views on complex writing (TL;DR – he dislikes it). Whatever you believe in, have a merry Christmas. This article is about the power of words and in particular why many still go to churches to listen to 2,000-year-old sayings and this suggests why they have such timeliness and universality – the wording used is easy to relate to by the majority and appeals to our emotions and senses. And that is largely what Christmas is too – it is cliched, but with good reason, of time of family, cheer to neighbours and indulgence in the sense, the touch of new hits, the taste of foods and sounds of music, more than religion. Don’t take my word for it, ask Dawkins. Next: Sentiment analysis – why should you do it?